The Ku-Ring-Gai Carnival of Cultures is an initiative of the St Ives Park Public School Parents & Citizens Association and the Australian Dancers Guild Inc. which held its inaugural event at St. Ives Park Public School on Sunday October 30th. 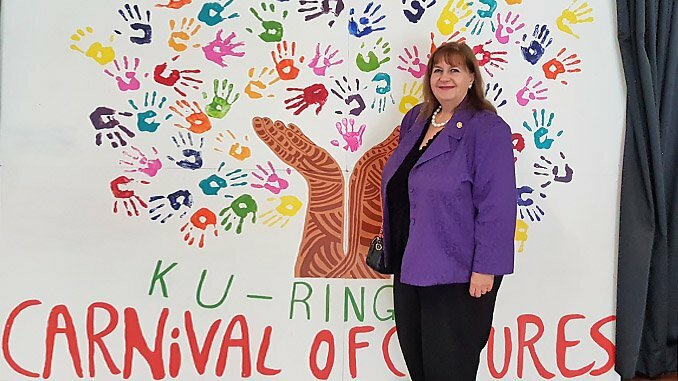 The Ku-ring-gai Mayor opened the inaugural ‘Ku-ring-gai Carnival of Cultures’ yesterday with a symbolic gesture, placing her hand-print among others on a mural to celebrate diversity. Mayor Jennifer Anderson said the carnival was a great sign that Ku-ring-gai’s diversity was natural and accepted. “I feel it is important that we acknowledge our modern, diverse community and pay our respects to the traditional owners of Ku-ring-gai,” Mayor Anderson said. Mayor Anderson said by 2030 the Ku-ring-gai population was expected to increase by thirty-thousand, with many born overseas. “Welcoming them and making them feel accepted and valued in our community is important,” Mayor Anderson said. The free event is an initiative of St. Ives Park Public School with hosted food stalls, performances and arts from all continents. Event attendee and mother at St. Ives Park Public, Mrs. Lorna Raine said she had Jewish heritage and migrated thirteen years ago. Mrs. Raine said the event was a nice way to show her family was accepted into the community. “As an immigrant to Australia, as a South African, I think it hits home even more,” Mrs. Raine said. “This is a day to celebrate diversity and that’s why we love it,” she said. Mayor Anderson said the event helped with understanding, tolerance and communication for young people and the wider community. “It’s important to teach our children to step outside their own experiences, to put themselves in the shoes of others,” Mayor Anderson said. Mayor Anderson said more support was needed to ensure migrants had a basic level of English. “This will assist in communication, understanding and social engagement,” Mayor Anderson said. Principal at St. Ives Park Public, Mrs. Gillian Tegg said forty per cent of students were from non-English speaking backgrounds. She said she was overjoyed the children could celebrate their culture and grow in a global community. “They are the future of the country,” Mrs. Tegg said.